The generous donors and supporters who sponsor projects and homes help Habitat provide affordable housing in the Chicagoland area in partnership with partner families. This support takes many forms. An important example of Habitat for Humanity's efforts to serve more families in the Chicagoland area is corporate partnership. 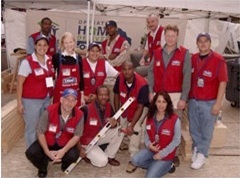 Corporate partners become essential team members. Their generous financial contributions, in-kind gifts and volunteer efforts help make it possible for Habitat for Humanity to operate in Chicagoland and affiliates to provide more families with decent, affordable housing and to build stronger communities. Please visit the corporate partners page for more information about these companies.